MTS carries a line of high performance masking tapes specifically designed to meet the needs of the thermal spray industry. These tapes provide superior mechanical and thermal protection. 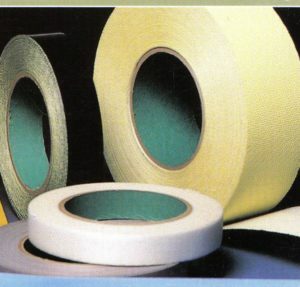 Excellent abrasion resistance makes these tapes ideal for grit blasting and flame metal spray applications. All our thermal spray tapes are engineered to provide superior tack adhesion ad remove cleanly from metal surfaces. These tapes are available in widths from 1/8" to 4", standard roll length is 36 yards. Custom die cut profiles can be manufactured, saving time during masking. This family of tapes provides superior mechanical and thermal protection, suitable for thermal spray applications. Our silicone coated fiberglass tapes features a silicone adhesive system that provides super adhesion to metal and themselves when two plys are needed. These tapes are fabricated from tightly woven high tensile glass cloth. The 162 series has adhesive on both sides of the carrier fabric. A thin aluminum foil is laminated to our fiberglass tape, making this tape an excellent choice in applications requiring a combination of comformability and high thermal and abrasion resistance.